Self-reliance has its place, but also its limits. Deep problems that we cannot overcome by our own abilities show us that we are not as powerful as we had imagined. The father in today’s gospel reading had learned through bitter experience that he could not relieve his son’s suffering, which was why he asked Jesus Christ to cast out the demon. The man was apparently not sure that the Savior could do so either, for he said “if you can do anything, have pity on us and help us.” When Christ responded, “If you can believe, all things are possible for him who believes,” the father was brutally honest, saying “Lord, I believe; help my unbelief!” Not only did the man know that he could not relieve his own son’s suffering, but also that his faith was far from perfect and mixed with doubt. When the Savior cast out the demon, the scene was so disturbing that most people who saw it thought that the boy had died. Imagine how terrified the father must have been. The disciples, who had the benefit of literally following Christ in His ministry and hearing His teaching daily, had not yet embraced genuine faith in Him. However, the Lord delivered a child from the deadly clutches of evil through the honest, imperfect faith of his father. The deep pain and challenge presented by his son’s suffering over the years had humbled the man. He knew that no version of self-reliance could help in this situation. He had faith, but was not ashamed to admit that it left much to be desired. If we are making use of the disciplines of Great Lent with integrity, we will develop at least a bit of the spiritual clarity shown by the father in our gospel lesson. The constant struggle to pray, whether at home, church, or elsewhere, reveals our weakness in controlling our own thoughts and turning away from distractions as we open our hearts to God. The more that we open our hearts and see our true spiritual state, the more we know our own need for healing beyond what we can accomplish by our own power. Our difficulty in fasting shows how little control we have over our desires for pleasure and getting our own way. The more that we seek to orient our lives to God, the more aware we will become of the weakness of our faith and of how devoted we remain to the false gods of this world, including especially our own will. The irony is that the only way to find strength is by acknowledging our weakness. The greater our spiritual clarity, the more we will know the infinite distance between the present health of our souls and the fullness of our calling to become like God in holiness. 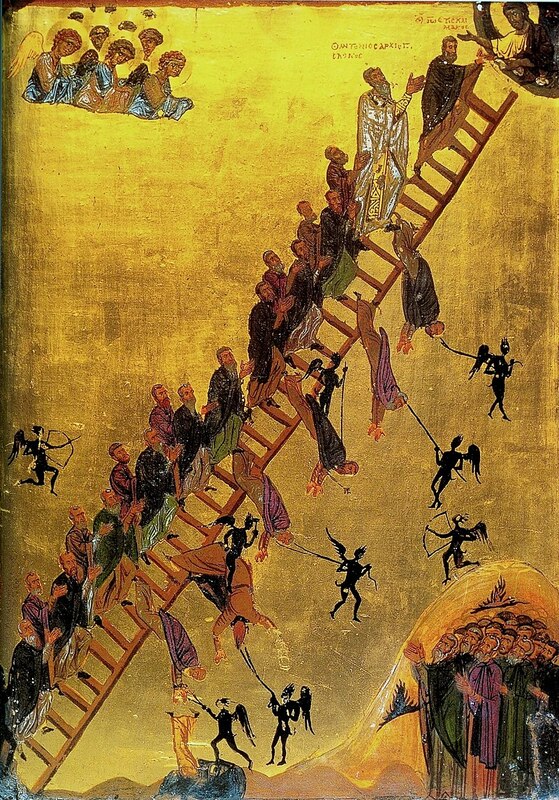 The only way to climb The Ladder of Divine Ascent, as described by St. John Climacus in his advice to monks, is to embrace the brutally honest humility of the father who was not ashamed to acknowledge the brokenness of his faith even as he cried out with tears on behalf of his demon-possessed son. As we continue the Lenten journey, we must remember that this season is not about us and what we think we can achieve spiritually by relying on our own willpower or virtue to perform acts of religious devotion. Spiritual disciplines are not exercises in self-reliance, as though we earn something from God by being diligent in performing them. Instead, they are simply ways of helping us share more fully in the life of Christ as we grow in recognizing our sinfulness and opening ourselves to receive His healing mercy. No amount of piety could conquer the power of death and make a path for us to participate personally in the eternal life of God by grace. Only the God-Man, in His full Self-offering on the Cross, could do that. Lent is preparation to unite ourselves to Christ in His Passion, for “The Son of man will be delivered into the hands of men, and they will kill Him; and after He is killed, He will rise on the third day.” He is the eternal High Priest Who “has gone as a forerunner on our behalf” into the Heavenly Tabernacle where He intercedes for us eternally (Rom. 8:34). The healing of our souls is found by sharing in the life of Christ. We will be able to unite ourselves to Him in holiness only when we know the weakness of our faith as we turn away from self-reliance and receive His mercy from the depths of our souls. The disciplines of Lent are teachers of humility that should help us “commend ourselves and one another, and all our life, unto Christ our God.” He accepted the imperfect faith of the father of the demon-possessed boy, and He will do the same with us if we come to Him in the same humble spirit. Doing so is really the only way to prepare to follow the Savior to His Cross and empty tomb. This was great. A real blessing for me at this time in my life. Thank GOD for HIS mercy and love for us. I pray for the Grace to show HIS kind of love towards the people I come in contact with in my life. Thanks for your comment. God bless you! What a heartening article, thank you. 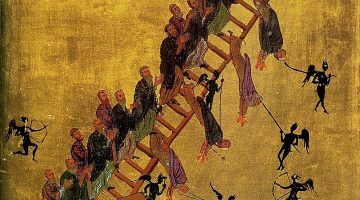 This Lent I seem more than usually to be a seething mass of faithlessness, grumpiness, gluttony and ingratitude. Lord have mercy on me. Blessings! Thanks for your kind message. Yes, may the Lord have mercy on us all. Thank you for your words. God Bless! You are most welcome. I appreciate your comment. Have a blessed Lenten journey!